An unbelievably dismal December finally yields up some quality, with what is almost certain to be the biggest film of the Holiday season. And yet, it's tough to recall an anointed season topper coming in with as many questions surrounding it as this one. Or perhaps appropriately enough for The Hobbit, which opens on Friday, it was the first Lord of the Rings film, which had people wondering if the first film in a fantasy series based on a book that had questionable popularity could really succeed and justify its big budget. Hey, did anyone just see a black cat walk past them twice? 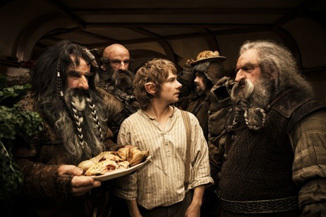 In the case of The Hobbit, the biggest struggles were in getting to the big screen in the first place. After the Lord of the Rings films grossed approximately eleventy billion dollars, looking back to JRR Tolkien's earlier work in the same world was beyond a no-brainer. However, after internal struggles at New Line, a.k.a. “screwing Peter Jackson out of his money," the project was initially given over to Guillermo del Toro, who was then fired/quit over creative differences, a.k.a. “he was trying to make it an R." So New Line and Jackson mended fences, and he got the gang back together, so to speak. And then it turned into two movies. And then three. Okay, you say, but wasn't there enough material for nine hours of film with the other books (12 if you count the extended editions)? Yes, but there we were dealing with a 1,600 page trilogy, whereas The Hobbit checks in an a brisk 300 or do. So we're undoubtedly dealing with a bit of filler here. It also trends a bit more kiddie adventure than Rings, although they've done their best to hide that fact in the ads so far. Is that not enough? Then let's add in that Jackson picked this film to debut a new filming technique that doubles the usual frames per second to 48, and which has been described as creating a hyper-real effect that is at times stunning, and at other times distracting and nausea-inducing. Although the regular 24 FPS version is out there, there going to be some inevitable confusion about formats, and it's far from a sure thing to win people over.